Saturday, June 1, 2019 from 10 a.m. to 4 p.m.
From gardens to gables and museums to mansions, Doors Open Owen Sound has given a wide-ranging look into our community’s rich heritage since 2003. This is our 17th annual Doors Open event. Come and celebrate with us! The City of Owen Sound is located on the southwestern shore of Georgian Bay in a valley below the cliffs of the Niagara Escarpment and at the foot of the Bruce Peninsula. Known as the Scenic City, Owen Sound is an outdoor enthusiast’s dream, but also features a thriving historical downtown with elegant, original architecture. Owen Sound has a rich and unique past – from being the last terminal on the Underground Railroad to being the birthplace of the prohibition movement (it was the last dry city in Canada). Today, Owen Sound remains an area of intrigue and excitement and offers a small but diverse place to raise a family or just visit for a day! 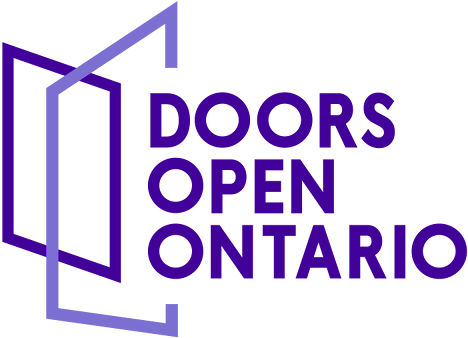 Doors Open Owen Sound welcomes residents and visitors to tour buildings that they might not otherwise have access to. The sites offer a place to discover history, celebrate heritage and explore something new – all free of charge. We are still looking for enthusiastic volunteers who are interested in participating in our community’s rich heritage. Come and spend some time immersed in one of our many historical Doors Open sites! Contact us by telephone at 519-376-4440, ext. 1256, or by email at sollerton@owensound.ca. Owned by Larche Communications, this local radio station was licensed and began operations in this building in 2008. In 2017, Bell Media announced that it would acquire the station and received approval from the Canadian Radio-television and Telecommunications Commision in February 2018. 92.3 The Dock plays “The Greatest Hits of All Time” (from the 1970s through the 1990s). In 2016, Grey County Council approved an addition and renovation to the administration building in order to bring more services together under one roof, making it easier to receive services in a community hub that is fully accessible. As part of the project, the Provincial Offences Court was moved here. The official ribbon cutting was held in September 2018. The Eddie Sargent House is an elegant and well-preserved Victorian home. The property was the former home of Eddie and Roma Sargent. Eddie was the Mayor of Owen Sound and the Member of Provincial Parliament representing Grey-North from 1963 to 1967, and Grey-Bruce from 1967 to 1987. The home occupies a prominent location on the west hill overlooking Georgian Bay. The First United Church has a history dating back to 1842 in the Ojibway reserve of Newash. The current church building opened in 1955. This year, First United will be the starting point for the Wiidosendiwag-Walking Together Tour of the traditional territory of the Saugeen Ojibway Nation. Guided tours will be available throughout the day. Saturday: 10 a.m. to 4 p.m.; book and bake sale (8 a.m. to 1 p.m.); guided tours at 10 and 11 a.m., and 1 and 2:30 p.m. Built in 1890 for a local hardware merchant, this house was rented in 1908-09 as the home and office of the United States Consul Colonel Augustus G. Seyfert, evidence of Owen Sound's importance in American shipping. Designated under the Ontario Heritage Act in 2010, the property is now the private residence of Shelley and Bev Buckton. This bookshop, begun in 1978 as a mail-order business specializing in books about woodworking, moved into their current location in 1984. Since 1987, they have focused on books about Owen Sound and the surrounding area – including historical, contemporary, natural and cultural publications. It remains an exuberant centre where readers and writers alike gather to exchange ideas and connect over books. This impressive 697-square-metre (7,500-square-foot) manor – a fine example of high Victorian architecture – features a library, music room, cage elevator, Roman arches, 3.66-metre-high (12-foot) plaster ceilings, stained-glass windows and a grand staircase. From 1919 to 1940, the house served as a maternity hospital. This former Canadian Pacific Railway station is an important part of Owen Sound’s cultural heritage. The station is a unique building, built in 1946, with elements of prairie, art deco and art moderne architectural styles. The property was vacant for 10 years until purchased by the City and repurposed to house this unique brewery and restaurant. Saturday: guided tours from 8 to 11 a.m. This structure was used until 1957 to house the Post Office, Customs and Inland Revenue Services. Since then, it has accommodated a bank, bookstore, fitness centre, apartments and commercial offices. Designated under the Ontario Heritage Act in 1980, the building is now home to the engineering firm of Aspin Kemp & Associates, and the interactive Assiduous Escape room. This library was founded in 1855 as a Mechanics’ Institute. The present neoclassical structure – completed in 1914 with a Carnegie Foundation grant – features exterior monumental brick pilasters with carved limestone trim and bases, and a barrel-vaulted ceiling with decorative plasterwork. An addition dates from 1972. The building was designated under the Ontario Heritage Act in 2009. Constructed in 1905 as a retail store, this building was purchased in 1924 by a rival retailer who operated it as a dry goods store until 1989. Designated under the Ontario Heritage Act in 1990, it is now home to the Owen Sound Artists' Co-op – a gallery/retail space for area artists to showcase and sell their work. The original town hall, built in 1868-69, was largely destroyed by fire in 1961. In 1965, the new city hall was constructed. In 2015, Council approved renovations of the existing building to add more meeting space and record storage, and to make the building fully accessible, improve the exterior, and create new energy-efficient building systems. It re-opened in November 2018. Owen Sound’s wastewater is collected in a sewer system consisting of 150 km (93 miles) of sewer mains that convey the wastewater to the treatment plant. Constructed in 1962, the plant was upgraded to full secondary treatment in 2017. Guided tours are available throughout the day to show the process of treating the wastewater before returning it to Georgian Bay. Community television has been a part of Grey County’s fabric since 1963. Doors Open allows us the opportunity to welcome members of the community to the local Grey County studio. Learn firsthand about the exciting world of television production. Appear on camera with your own station ID, meet local on-air personalities, tour the facility and enjoy light refreshments. Since the late 1800s, this building has been home to Molsons Bank, the Canadian Pacific Telegraph and Ken Henrich Jeweller (which only closed in 2014). Listed in 2018 on the city's heritage register, the building is now home to The Workshop – a local arts hub where you can learn about making pottery, jewelry and more.